This sermon was delivered at Shaeffer-Ashmead chapel at Lutheran Theological Seminary at Philadelphia on August 28, 2013. Welcome to this first service of the Eucharist. A very warm welcome indeed and I invite you to many services of worship here in the Chapel. Please know that we worship in diverse ways. Today’s service is only one example of the many settings that we use to praise our God in Christ Jesus our Lord. When The Rev Dr. Martin Luther King Jr delivered his famous “I have a dream Speech” at the March on Washington which is commemorated today only one television channel, namely CBS, interrupted its lighthearted entertainment shows to cover the speech, not only because that was rarely done at the time but the networks were worried that the speech would incite violence. Not only was the city encircled by troops but, in fact, a deputy attorney general had his finger on the switch of the loudspeaker system to silence Dr King had his speech incited a disturbance. Control is often an unhealthy habit of leaders and authorities who resist adaptive change. Thus leaders like the leader of the synagogue in our lesson from Luke today are continually worried about disruption. The leader of the synagogue cannot see, in fact, he is blinded from seeing, how God can be present and act when the ceremonial law, which he must guard is not observed. The woman is healed by the Lord of the Sabaath who understands that all ceremonies and religious rites –no matter how important and necessary to learn and you are here to learn them– are subject to human need and context. In fact as much as we have learned that ritual practice is needed for good order and also fulfills a human religious need it has nothing to do with salvation and always stands under the critique of a more radical understanding that we are justified by the faith like that of the woman in our text that makes us whole. In addition our ceremonies, that is, our liturgies, our worship must always be ready to be disrupted, that is broken open by the prophetic call for inclusion and justice. The holy is not made unholy by those in need. Jesus gives the holy meaning by healing the woman in need. Isaiah’s vision of Justice from our first lesson, which Dr King captured in his famous speech, breaks in. Luke contrats the anger of the leader with the woman’s response, which is to give thanks and to praise God. As one scholar has noted Luke is always intent on troubling a church that can become too complacent, self-justifying and forget to praise God. Gentiles, women and children, Samaritans, prodigals, and eunuchs, and others on the margins are always breaking open the complacent and exclusive church by the power of the prophetic Holy Spirit. Note how Jesus takes the tradition that he has inherited as he is teaching in the synagogue and honors it by adapting it for the sake of the people and the world he came to save bringing good news of salvation to those whom he saw even when some of his contemporary religious authorities did not see the people before them. To recognize difference in the persons before you, calls for continual repentance and adaptation of a community and a renewal of its practices. Things cannot stay the same. Today we remember two African saints, St Augustine of Hippo and Moses the Black, each of whom understood the importance of change and adaptation in relation to the tradition. In the case of Augustine theological and institutional change and in the case of Moses a personal conversion. Augustine also honored the tradition but it was not the same after he used his reflexive imagination and abilities to pass on a new version of the tradition adapted to his African and Roman cosmopolitan context. There is perhaps no one other than St Paul who had a greater impact on the Western tradition than Augustine. The Western tradition took his theology and left out his vibrant African embodied rhetorical style his call and response worship style and Europeanized it and made its context the norm. Against the “conservative” Donatists Augustine maintained that salvation does not depend on the perfect observance of religious practices and ceremonies. To them if the sacraments were not observed correctly all baptized souls would fall out of heaven. Like the religious leader in the synagogue they felt that, if something went wrong in the leader’s practice of a rite, the state and all of society would tooter and fall. Augustine said of them, “These frogs croak in their own little pond and sing we are the only church, while the sum never sets on God’s church catholic.” He knew that the Church is not the kingdom of God but a mixed body of saints and sinners between the world and the always coming reign of God intimated in the Hebrews lesson. The Donatists strike me as the kind of Christians who are always angry about something because the complexity of the world makes it impossible to become completely counter-cultural without seeming like hypocrites and this makes them miserable. They want to be out of the world and are too enmeshed in it. Augustine invites us to be cuture critical but knew that you could not escape from it. Over against the more liberal Pelagians who were moralists and thought they could always improve themselves and society into the kingdom of God by force of will, Augustine uses his enormous erudition-his knowledge of the Bible, Greek and Roman history and mythology other religions– to grow in the faith of the grace of Christ in relation to the enormity of human sin and injustice. When Pelagius once lamented that he was only teaching what Augustine had once taught years before, the Saint responded, “I changed my mind.” Never stop learning! His life was a series of conversions. One of which was to monasticism, one of the oldest institutions in the church, which as enormous integrity about change and being genuinely counter-cultural. Was born into slavery to an Egyptian official’s family. An unruly thief, he was driven from the house and fell in with a band of robbers. On the run, he took refuge with hermits at the monastery of Petra in the desert of Skete, Egypt. He was converted and joined them as a monk. . It is said that because of his reputation the monks did not want to accept him into the community but their leader saw the potenual in him taught him the Christan tradtion and after catechizing him baptized him. 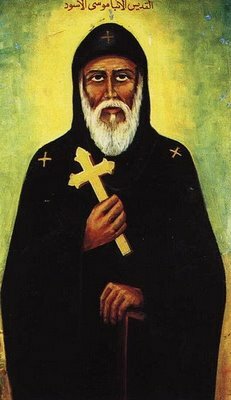 St Moses the Ethiopian lived as a hermit rejecting all the amenities of life. The Dean told me that he tied his hair to a rope such that when he dozed off as he was studying the rope would pull his hair to awaken him. But he also understood the limits of ascetic rituals.The abbot ordered the brothers to fast during a particular week, perhaps in Lent.. Some guests came to Moses during the fast, and he prepared a meal for them. Neighboring monks reported to the leaser that Moses was breaking the fast. When they came to confront Moses, they changed their minds, saying “You did not keep a human commandment, but it was so that you might keep the divine commandment of hospitality” .Having been violent he became a pacifist anbd refused to defend himself when his monastery was attacked and murdered 405 by Berbers at Petra, Skete, Egypt. Dr King, the great repairer of the breach, was also martyred for his vision of a society that would reflect the vision of Isaiah and our Lukan Gospel. But here is more, Luke knew that the way of our Lord Jesus Christ was not just to renew the tradition or usher in the vision of Isaiah but to take up the cross for you and me. It is said of Moses the Black that one day he was called to a meeting of the monks to call a brother to repentance. Despite regular admonitions to attend he refused but carried a large jar that he had filled with sand in the other direction. They pursued him but he said, “Why should I judge another when I have a jug full of my own sins.”. It is the cross that the authorities ultimately made Jesus bear and he bore that for you and me. A gift far greater than his miracles and teaching—a gift of freedom that gives you as leaders and developing leaders the freedom to honor and critique the traditions that we cherish and adapt. On this dream day praise God for the tradition we learn in this place and the freedom to reform it to include all God’s children. Praise God for all those who have been able to stand straight by the power of the Spirit and the good news of Jesus Christ.. Praise God for Jesus our Lord and Savior, who, in a few moments, will serve us as host with great hospitality refreshing and renewing us seeing everyone, knowing everyone’s name even that of our healed and unnamed woman and excluding no one.